The 'Duke' blueberry bush (Vaccinium ‘Duke’) is an early ripening variety that will grow to a height of 4 to 6 feet tall. 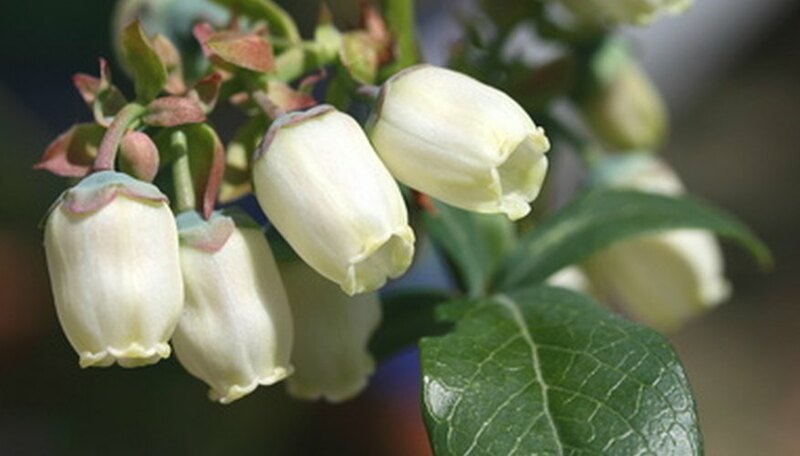 'Duke' blueberry bushes produce white flowers in May and berries that ripen in June. Because of its year-round interesting foliage it can be grown as an ornamental shrub or as hedging. 'Duke' blueberry bushes are hardy to U.S. Department of Agriculture plant hardiness zones 5 to 8. Select a location for your 'Duke' blueberry bushes that receives all-day sun with well-drained soil. Blueberry plants need lots of water so you may want to plant close to your water source. Remove all weeds from the planting site. When the soil is dry enough to work, rototill to a depth of 12 inches, breaking up clumps until the soil is light and airy. Test the pH level of your soil. Use a garden-center kit or send a soil sample to your local cooperative extension service for testing. All blueberries require acidic soil. According to the Missouri Botanical Garden's Kemper Center for Home Gardening, 'Duke' needs soil with a pH between 4.8 and 5.2 to thrive. Add any soil amendments recommended by the pH test. Dig a hole that is 1 foot deep and 2 1/2 feet wide. Space the planting holes 2 feet apart. Place half of the removed soil into a wheelbarrow and mix in an equal amount of moist peat moss. Remove the 'Duke' blueberry bush from its pot and use your fingers to loosen the outside of the root ball. Place the root ball into the hole and add or remove soil so that the bush will be planted 2 inches higher than it had been growing. Cover the roots with the amended soil in the wheelbarrow and add more of the gardening soil to completely fill the hole. Water the 'Duke' blueberry bush until the water puddles around the base of the plant and keep the soil moist at all times. Pour a 3-inch layer of peat moss around the base of the bush and spread it completely around the plant.